Dating a werewolf can get a little hairy, literally and metaphorically. Rayne Manchester's suitors learn this pretty quickly in this fun, action packed shifter romantic serial. Rayne and her siblings, Rhyme and River, have been through a lot lately, and the loss of their father is only more fuel for the firestorm that is their lives. Each installment will serve up romance, suspense, intrigue, and action. 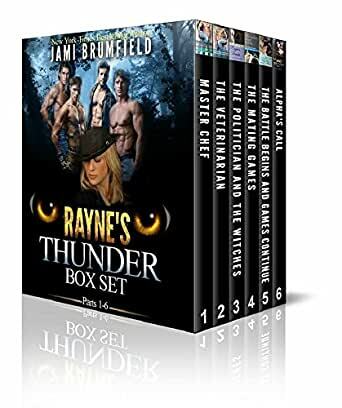 This box set contains Rayne's Thunder complete romantic serial from beginning to end, all six parts. My father's death rattled me to the core. A part of me died with him and left my world spinning out of control. I needed the sanity, the comfort home and my pack offered. Returning home was the only option. Father was always overbearing, determined, protective. He felt he knew what was best for all of us, even if it wasn't. But this time he really overstepped, I mean to tell me who and when I need to marry and mate from beyond the grave is just inexcusable and to make it worse, he wasn't here for me to tell him how furious I was with him. There's only one saving grace... at least he left me with a decent list. I'm looking forward to my first date with Brick Mason. I hear he's a mater chef and comes from a respectable alpha family in Wyoming. I suppose we'll see. Whatever happens finding true love is going to be an adventure. I hope you'll join me on my journey to my happily ever after. "Captured my attention from the very beginning." "A great start to a new series! The story quickly grabbed my attention and kept me reading until I finished"
"Excellent book that kept me hooked from beginning to end." "I love the plot of the story. It's fun, fresh and unique. The book is well written and believable." "This is the first book I have read by author Jami Brumfield and I think she has taken a creative and different approach on romance serials that are currently so popular. " "I love the characters and their personalities and how they gel as a family"
"I'm totally hooked on this series." "I always enjoy Jami Brumfield's new and innovative characters and plot lines. There's something for everyone in this series, and I think I've just found another book boyfriend to drool over. Buckle up folks. This promises to be one sizzling series." "INCREDIBLE exhilarating well written read by a genuinely gifted author. The combination of authenticity and fantasy make the story convincing, and awe-inspiring." "Jami Brumfield doesn’t waste any time in diving into the meat of this hot new series." "I like the concept to this new paranormal book by Ms. Brumfield. It is a story written inside a story." "You have got to love the bad boy shifters. The story line in this book is amazing!. The characters are incredible!." I really enjoyed this series. I recommend this book to shifter romance book lovers of there i would definitely read it again and other books by this author too. I read each & every one of the installments for Rayne's Thunder as they went live, Jami kept me riveted when they finally arrived too. Devouring them all as soon as they arrived & now I can read them all again in this boxset.... EEEEEEKKKK. Rayne's world is rocked by the death of her father, the alpha, she heads home from college in time for the funeral & the reading of the will. Her father has a particular request of Rayne & her siblings, giving them an inhertance they'll receive ONLY if they are ALL able to find a mate & marry within the year. This is Rayne's journey to finding her mate & all the ups & downs that comes with it. Rayne, pack werewolf Princess returns from college for the funeral of her beloved father and alpha is told of law her father has decreed to her and siblings so they can inherit. All siblings agree to follow the law because if one doesn't do it or fails they all lose the inheritance. The law is that they all have to mate and be married within 1year and to help, their father had left a list of suitors for each of them. Rayne is set up on dates and then the mating games, all to find the male to whom she would mate with. Meanwhile, war also breaks out with a pack of rogue wolves and witches set to take the Alpha seat from the family. Will Rayne find her one true mate, will she survive the war? Something about the war is set to change Rayne's entire world, will she be able to handle the change and rescue her family? I absolutely loved this boxed set and can't wait to read about Rhyme and River. A definite must read for lovers of paranormal. Rayne's portion of the Dating a Werewolf series was very entertaining. I enjoyed the Mating Games that evolved from the requirement River, Rhyme, and Rayne's father set forth in his will for his children to receive their inheritance. Assuming the position of pack alpha was River's responsibility, but along with that, he and each of his sister's had to take a mate and marry within the year. Follow along on Rayne's action packed adventure to finding her mate. This is one of the best books. I've ever read!😁 The characters were amazing,and the plot, was fantastic. I look forward to more than this cast of characters! Loved this box set. It introduces us to the Manchester siblings and what they have to do to inherit. The action starts right off and doesn't stip throughout. I liked this series and look forward to the other siblings stories.